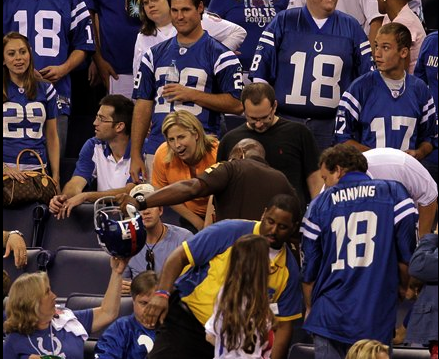 Brandon Jacobs lost his helmet -- by throwing it into the crowd -- in the Giants ____ lost to the Colts. Week 2, and we’ve got several surprising starts. The Cowboys and Vikings are 0-2 and the Bucs and Chiefs are 2-0. And who would have thought the Steelers would be 2-0 without their inglorious leader at quarterback and having to play two playoff teams in Atlanta and Tennessee? We had several starting QBs get yanked early who will not making the start in Week 3. Unfortunately, it looks like our boy Jason is one of them. Ronnie Brown #23 – racked up 80 yards on 13 carries for a nice 6.3 ypc. He also caught a pass for 3 yards and lost a fumble in the Fin’s 14-10 win over the Vikings in Minnesota. Heath Evans #44 –The Saints had a rough time Monday night even though they won 25-22 over the 9ers. Heath got stoned on 3rd and goal by Patrick Willis. He finished the day with 1 carry for zero yards and a catch for 18. Carnell Williams #24 – carried the ball 27 times for 51 yards and had one catch for 8 yards in a workman like performance against the Panthers as the Bucs got the win, 20-7. Ben Tate #43 – is on IR with the Houston Texans. Brandon Jacobs #27 – had only 8 yards on 4 carries and lost his helmet in the 38-14 loss to the Colts. He’s frustrated with being the No. 2 guy but hasn’t asked for a trade as has been reported. Devin Aromashadu #19 – After having a good game in Week 1, Devin was inexplicably benched this week, only playing one down in the Bears’ big win over the Cowboys, 27-20. Even Devin doesn’t know why. Rumor has it that the primary complaint from the coaches is his poor job of blocking in that first game. That said, expect to see him play this Monday against the Packers. Ben Obamanu #87 – Ben had 2 catches for 30 yards and the lone receiving TD for Seattle as they were handled by the Broncos, 31-14. The surprising news is that the Seahawks chose to dress Ben over their highly touted rookie Golden Tate. Prechae Rodriguez #85 – is with the Saskatchewan Roughriders in the CFL, but is currently banged up and not playing. Ben Grubbs #66 – started for the Ravens in a defensive battle won by the Bengals, 15-10. Marcus McNeill #73 – is still a holdout for the Chargers, and I don’t blame him – who wants to work for AJ Smith? King Dunlap #65 – played mainly on special teams in the Eagles’ 35-32 win over the Lions. Tyronne Green #69 – didn’t play this week for the Chargers. Tim Duckworth #78 – played in the 20-7 loss to the Buccaneers, but didn’t start. Jay Ratliff #90 – had 2 tackles in Dallas’ 27-20 loss to the Bears. Prayers go out to Jay and his family as he will miss some practice this week due to his grandfather passing away. Quentin Groves #52 – started but only had one tackle against the Rams in Oakland’s 16-14 win. Spencer Johnson #91 – grabbed 3 tackles in the 34-7 loss to the Packers in Green Bay. Pat Sims #90 – Pat didn’t get the start and didn’t record a tackle but had what coach Mike Zimmer called “the play of the game” – a tipped pass that was intercepted. The Bengals held on to win a defensive struggle 15-10 over the Ravens. Sen’Derrick Marks #94 – had 3 tackles and played quite a bit in Tennessee’s 19-11 loss to the Steelers. Antonio Coleman #59 – has not played a game yet for the Buffalo Bills. Karlos Dansby #58 – made the game saving tackle against the Vikings hitting Adrian Peterson in the hole and holding onto his knees while his teammates cleaned it up. The Dolphins won an improbable game in the MetroDome Mall of America’s Stadium, 14-10. Will Herring #54 – Will got a tackle in the Seahawks 31-14 loss to the Broncos. Takeo Spikes #51 – was hurt early but still managed to have 5 tackles on Monday night. He is being held out of practice this week with a knee injury but hopes to make it back by Sunday. Reggie Torbor #53 – Reggie got in on one tackle in the Bills’ 34-7 loss to the Packers in Green Bay. Jonathan Wilhite #24 – did not get the start but recorded 2 tackles for the Pats in their 28-14 loss to the Jets. Jerraud Powers #25 – had a good night with 3 tackles and an INT for the Colts as they beat the Giants 38-14. Jerraud has also been returning punts for the Colts and picked up 8 yards on three tries. Rod Hood #37 – is on IR with the Tennessee Titans. Walt McFadden #22 – has not played yet for the Raiders. Pat Lee #22 – played but did not record a stat in Green Bay’s win over the Bills 34-7. Robert Bironas #2 – was just 1/1 with a 21 yard field goal in the Titans’ 19-11 loss to the Steelers. Damon Duval #15 – was 4/5 on field goals last week and 2/2 on XP, for the season he is 27/35 on Field Goals and 31/31 on PATs and has scored 124 points using wacky Canadian math. HB Tristan Davis #20 was cut by the Dolphins after he fumbled a kick return in the preseason. He has not been picked up by any other team. HB Rudi Johnson is MIA, last seen with the Lions. HB Tre Smith was last with the Hamilton Tiger Cats, but is not currently active. WR Tim Carter is MIA, last seen with the Rams. WR Courtney Taylor is very hard to track down, last seen with the Seahawks. OL Wayne Gandy is a free agent. OL Kendall Simmons is hanging around with the Buffalo Bills. OL Jeno James is MIA, last seen with the Dolphins. OL Mike Pucillo is out of football, last seen with the Browns. DE Stanley McClover is MIA, last seen with the Texans last year on IR. LB Tray Blackmon is MIA, last seen with the Calgary Stampeder’s in the CFL. CB Kevin Hobbs #23 was with the Lions, then the Dolphins, then cut. Questions, comments, anyone you want to know about that’s not listed? Let me know and I’ll have it up next week! Thor Burk came to Auburn as a young man in 1997 and never left. He’s always loved Bo Jackson, but his true love of Auburn football proper began in the early 90s. In addition to writing a weekly report on Tiger greats in the NFL, he’s a professional BBQ judge (Memphis certified), and all around foodie. Write him at [email protected]. You can read his notes on Week 1 here and his former-Tigers-only break down of Madden’s revamped rating system here. I always pick my NFL buy the Auburn players on them. Dolphins? Still dislike them because of all the Bama players when I was a kid. Bills? Will never see them. Raiders? Don’t bench Jason, and maybe I could stomach it — especially since my local Broncos haven’t had an Auburn player in the 17 years I’ve lived here. Titans? Sen’Derrick and Bironas, maybe. Colts? Jarraud has always been one of my favorites and I like seeing Peyton succeed. Redskins dropped too many AU guys. Same with Seahawks. Maybe this is why I watch as much football on Saturdays and rarely turn on the set for the NFL. Go Bucs? Please stop posting Brandon Jacobs as an NFL player from Auburn. Yes he played a season at Auburn, but was run out of town because of attitude problems. Additionally he doesn’t claim Auburn in any fashion, Southern IL. instead. He also clearly doesn’t represent the Auburn family in any way I can see.